I am pleased to be in included in the Faculty Works exhibition that opens August 22, 2017 at the Hokin Gallery of Columbia College Chicago. Featuring work completed in 2016 I will have on view Cobbtown 72 in. x108 in., chalk, charcoal, gesso on prepared raw canvas. I am pleased to be included in the group exhibition "Obsession, Improvisation, Collaboration" that will be on view at the Visual Arts Gallery of Governors State University, Curator Jeff Stevenson, Director. Here is a video of my slide lecture presented at PechaKucha Night Chicago Volume 39 back in September 2016. Introduction is by Chicago Architect Peter Exley. I am very pleased to have my large painting Dingess, seen here on the far back wall installed in the Columbia College Faculty exhibition in the shared offices of the Design and Art and Art History Departments. 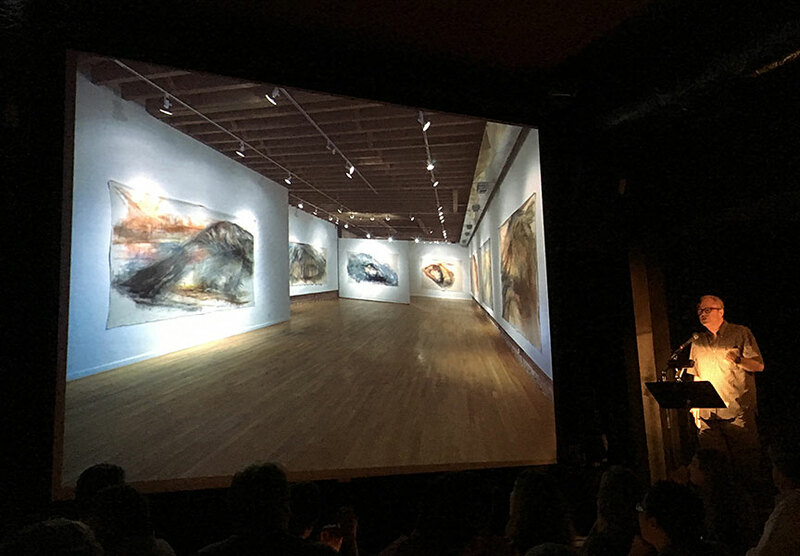 Shown here is the beginning of my presentation at the recent PechaKucha Chicago Volume 39 where I focused my talk and images on the last six years of my forty year career. The image on screen is of an installation view of my one-person exhibition Alpestrine. I am pleased to announce that I have been selected to be one of the guest presenters in the September 6th PechaKucha 20x 20 Chicago Volume 39. I will be one of ten noted Chicago artists, architects and designers to talk in this innovative format.